The biggest misunderstanding that ever existed is that there was something inside of us that we needed to avoid, run away from, an emptiness that we needed to fill up with something outside of us. And so we created pain-killers. 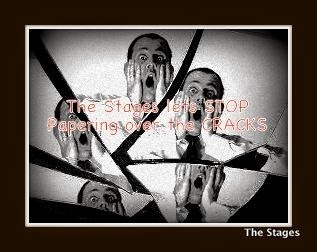 Dissociations came in all different forms–pills, alcohol, shopping, relationships, food, work, television, gossip, distractions, even holding onto a diagnosis and letting it be our identity–addictions and dissociations on different levels that kept us running from the pain of believing in our own fears from childhood. My drug of choice was relationships and I ran from my fears and let them control me by finding false comfort and security in my romantic relationships–my perceived lack within fueled the need for this love outside of me and made me believe I was only whole and complete when the relationship was there. Whatever we are using, holding onto tightly, and the most afraid to let go of, is our pain-killer and this is our self-imposed prison, which means we have the key to unlock and free ourselves. The truth shall set you free. The truth is love. The key is the path of self-love. It’s the courageous path that we step onto when we finally throw up our hands and say we’ve had enough and we know there’s a better way–or maybe we hit our knees and are finally ready to listen. The process of self-love is to begin to look at our pain and fears in the face so that you can finally release them rather than be controlled by them. Forgiveness, letting go, and opening our heart encourages self-love. The limiting pattern, trigger, or codependency in our daily lives is in response to pain–pain from a past experiences of our childhood that when left unprocessed comes into our present lives and is projected into our future. In every moment we feel triggered we can break our heart open more and love ourselves more or we can close our hearts and put walls up of blame, judgment, shame and allow the outside circumstance to control how we feel and who we will be in the world. We clear emotional patterns by allowing the feelings to come up to release and we move through them into the truth–which is our recovery. On the other side of childhood pain is freedom. Forgiveness allows us to unhook from painful emotions from past experiences. Rather than saying we think it’s okay what happened, we’re choosing to free ourselves of anger or resentment, and other emotions so that we can move forward in our relationship with our child within and create the future for ourselves that we truly desire. We begin with forgiving ourselves first and then we move to others because we cannot give to others what we have not given to ourselves first. Through the process of allowing pain and emotions to come to the surface, not only does everything come up to release but our child withins desires come up as well. And this is our push to really go forward. We find out what we’re really here for. As we dissolve pain, hurt and fears, this purification process allows us to step into being the co-creators that we are. As we clear these blocks to who we really are, we experience a new way of being, a lightness, and aliveness. From this new place of freedom from fear, we begin the co-creative dance with our freed child within. We step into the flow of life with our inner guide, the intuitive voice of love and knowing, showing us exactly where to go. We are no longer blocked from anything we desire, the belief in scarcity and lack is a distant memory, and through this radical internal shift we allow our child within to flow its abundance to us, allowing us to serve on a higher level, becoming a beacon of light for those who are beginning their journey. We are all in this together.